If you liked my Great Lakes Beanie you are going love the Great Lakes Slouch! The Great Lakes Slouch is sassy and fun. Great to wear and fun to crochet. I think you’re going to love it! Like her little sister, the Great Lakes Slouch gets her amazing texture from changing up of how basic stitches are worked. You start off by working single crochet in the round through all the increases. Remember, you can increase or decrease the circumference of the hat by making changes in this increase section. Then you start working in joined rounds. Sometimes you’ll work on the right side, and on the rows with the bumps, you will turn your work and crochet with the wrong side facing you for that row. 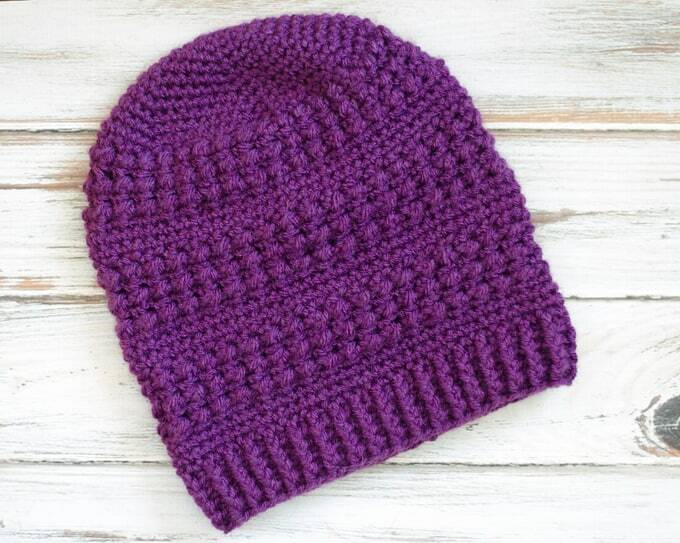 The slouch is fun to crochet and you can get one done in an evening or two. 4 oz Worsted weight yarn. I used Lion Brand Vanna’s Choice in Eggplant. Fits a medium sized adult. Finished size: About 20″ around by 10.5″ long. R1: 6 sc into ring (6 sts). Work in rounds through row 11. Note: in the next section, work rows by start and stopping each round, joining with a sl st to the start of each round. R12: Slip stitch to next st. ch1, sc in same st, ch 1, skip next st, *sc in next st, ch 1, skip next st*, repeat * to * around. Sl st to first sc at end of round. R13: TURN WORK so wrong side of hat is now facing you. *Sl st in next space, hdc in same space*. Repeat * to * around. At the end of the round, sl st to 1st sl st. This will make bumps on the right side. At the end of the row, there should be 36 bumps. R14: TURN WORK so right side of hat is now facing. Ch 1, sc in same st as joining, ch 1, skip next st, *sc in next st, ch 1 , skip next st* Repeat * to * around. R39: ch 2, hdc around (72 st), join. R40-43: ch 3, *front post hdc in next st, back post hdc in next st* repeat * to * around. If you’d like you can add more rows of post stitches to make the ribbing larger. 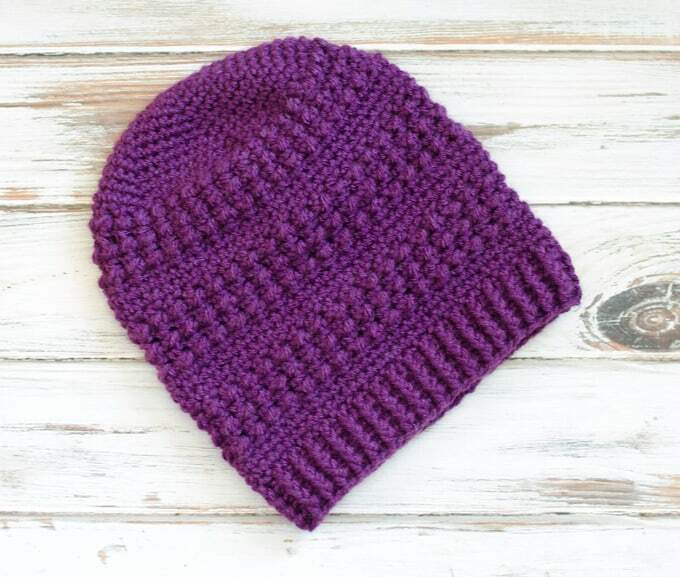 You can also finish off by doing a round of single crochet like we did on the Great Lakes Beanie. Love the Great Lakes Slouch? Be sure to check out the Great Lakes Beanie! I love seeing your finished projects! If you share your Great Lakes Slouch on Instagram, be sure to tag me @crochet365knittoo. If you are on Facebook, stop over to the Crochet 365 Knit Too Facebook page and share a photo! I’d love to see your work! Written pattern copyright Cheryl Bennett 2018, all rights reserved. Please do not reprint or repost this pattern. If you would like to share this Great Lakes Slouch pattern with others, just link to this page. If you’d like to make items for sale from this pattern, please visit my About page for more information.